Building our own home has been a massive project for me and has taken 3 years plus nearly all of my time. This involved demolishing most of an existing house and rebuilding it to modernise and extend it. The house contains lots of new technology and is very energy efficient. I don't intend to do any more projects like this again (well not at the moment anyway). One of the features of this house is a room just for my Electronics Workshop. It is about 14m² in size, so should accommodate everything I need. Moving all the furniture and equipment was hard work, not something you want to do too often! 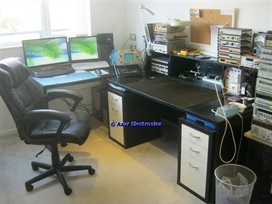 The Electronics Workshop is now set up with cupboards, drawing board, desk, workbench and equipment. 2 spare kitchen cupboards have been strengthened and modified to make mobile equipment trolleys on castors. I could not find anything suitable to buy for this purpose. This should make getting either the spectrum analyser stack or network analyser stack next to the bench much easier. As they are permanently cabled up this will save time too. I have managed to do more design work in the last 3 months than the last 3 years. 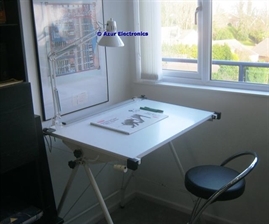 It really does make a huge difference to have everything available and ergonomic. Biggest problem is remembering how everything works! A few pictures for insurance purposes! Bench with regularly used equipment. 2 sets of drawers for tools, cabling, accessories, adaptors and stationery. Side table for Computers. 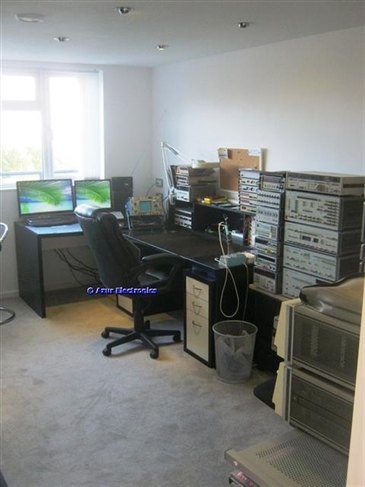 The main PC with 2 screens is for CAD, pdf Manuals, Microchip PIC Programming, MS Office, Internet, etc. This PC is connected to my home server network for automatic backups. The 2nd PC runs Windows XP for legacy applications and my only floppy disc drive. 2 'Stacks' of fixed equipment, meters on the left and signal generators on the right, plus some storage space under. 2 'Mobile' Cupboards on castors so they can be wheeled up to the Bench when needed. The 'Stack' on the left is for Spectrum Analysis. The 'Stack' on the right is for Network Analysis. 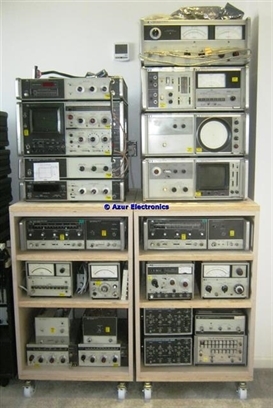 Storage space under for 2 Sweep Generators and other test equipment. 2 'Mobile' Trolleys on castors so they can be wheeled up to the Bench when needed. 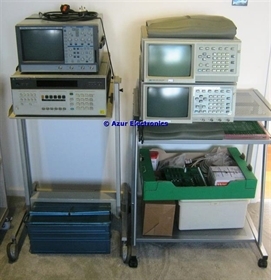 The 'Stack' on the left is for the Modulation Analyzer and LeCroy Oscilloscope. 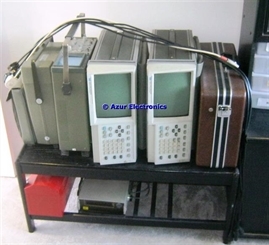 The 'Stack' on the right is for Logic Analysis (Analyser & Generator). Table with work in progress awaiting test. 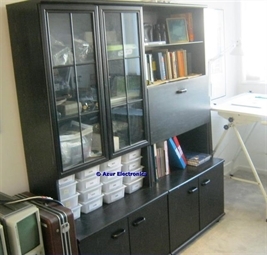 Storage Cupboards for components, parts, equipment, manuals, etc. CAD is used for circuits, printed circuit boards, mechanical parts but the Drawing Board still gets used for design work, large drawings, etc. 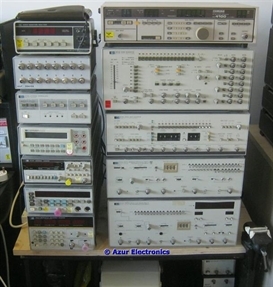 I have also got some equipment stored in the Loft, mostly awaiting repair or parts For Sale. My Current Projects list still has a lot of work to be finished. I am also working on some new designs of equipment that maybe can be manufactured under licence. 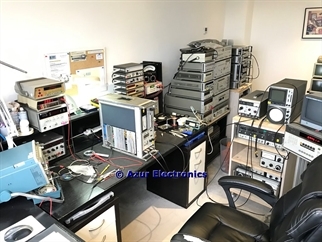 Electronics is a part-time hobby for me now and it's great to have a room dedicated to it. Replaced my main PC which was running Windows Vista with a newer PC running Windows 7. It takes days to install the OS, Updates, Applications & Data! Updated main PC to Windows 10. Quite a few changes to the equipment in the photos as items have been replaced and sold. 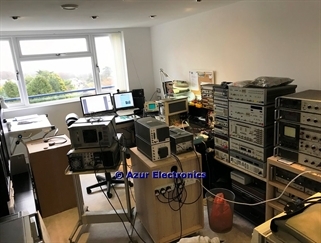 Busy repairing the Network Analyser which has developed a fault. The Workshop continues to evolve with some equipment sold and some projects completed.